Central City has a rich gold mining history having been established in 1859 under the name the “Richest Square Mile on Earth,” a testament to the richness of the surrounding area. Today, Central City is surrounded by remnants of many of the most iconic gold mines in Colorado. It is located in the Rocky Mountains towards the southern end of Gilpin County about 35 miles west of Denver. Gold was first discovered near the current site of the Central City in 1859 by John Gregory in what was later named the Gregory Lode and within two weeks thousands of fortune seekers were all over the area prospecting for gold. When William Byers, the Rocky Mountain News founder pitched tents on the flat ground at the center of the growing mining district in 1859, Central City was born. At its peak, Central City was providing supplies to over 10,000 miners in the surrounding Rocky Mountains. 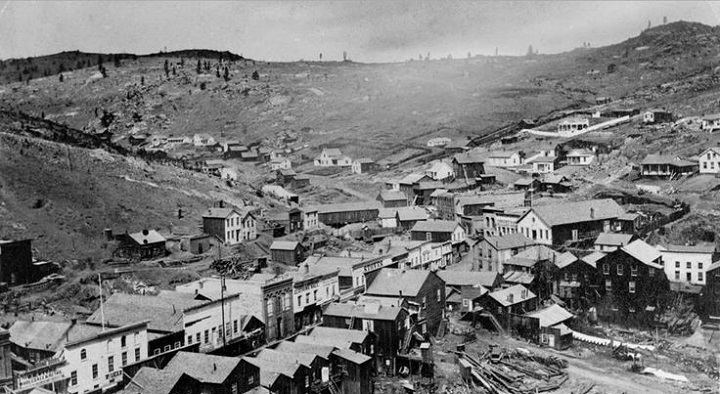 The city was home to thousands of miners most of whom mined the surface placer gold in gulches and streams around the city. The major places where gold was discovered in the central mining district include Gamble Gulch where gold was first discovered in 1859, Russell Gulch discovered in 1859, the Dirt and Perigo Mines discovered in 1860, and Rollinsville where gold was discovered in 1897. Many gulches and creeks around the city had mining operations and still have traces of gold that one can pan. Central City district had some of the richest gold ores in Colorado. It is reported that the city produced over four million ounces of lode gold and over thirty thousand ounces of placer gold. This puts it among the top gold-producing districts in the United States. However, by 1900 most of the miners had left due to a decrease in the amount of gold being produced in the area, but some mining did continue in a number of underground mines around the city way up to mid-1950s. Central City is surrounded by a number of ghost towns and old mines that tell the story of the early days of gold mining in the region. Quite a number of the old mines allow for planned tours and gold panning expeditions for visitors. This makes visiting Central City a perfect getaway for anyone interested in gold panning, and it is especially popular due to its close proximity to Denver. As an important mining city, Central City is surrounded by a number of old gold and silver mine that one can visit to learn about gold mining and also to try their hands at gold panning. 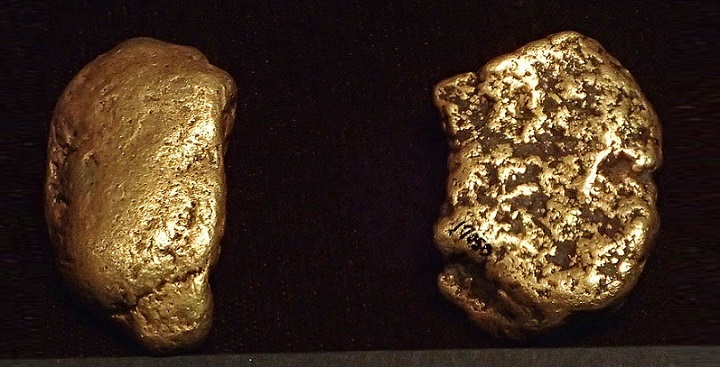 A pair of gold nuggets found in the Central City area. Each one weighs over an ounce and represent the type of gold that was found by the early placer miners in the rivers and creeks. The Hidee gold mine is located in Virginia Canyon near the Glory Hole Area famously referred to as the heart of the richest square mile on earth. The mine was established in the 1880s and produced pyritic gold ore up to 1959. The mine also produced silver and copper with the ore estimated to produce as high as 20 ounces of silver, 112 ounces of gold and about 16.5% of copper per ton. It is estimated that mines in this location produce gold worth over 89 million U.S. dollars. After its closure in 1959, the mine remained idle until 1980 when it was reopened by Charles “Choppo” Fetterhoff to offer educational tours down the shafts. Today the mine is run by the Hidee Gold Mine Company which conducts educational tours to the mine explain various methods used to mine gold at the mine during various stages of its operation. Visitors are also allowed to try their hands at mining gold using rudimentary tools used by early gold miners in the Central City mining district. Another interesting old mine near the Central City is the Glory Hole Mine. The mine is located on Quartz Hill and was one of the most productive gold mines during the great depression. The mine was established in the 1920s by Dr William Muchow who bought several mine claims on the hill from the original owners to create one large mine. Gold was first discovered around the location of the mine in 1859 with many people staking up claims. However, due to the richness of the area in gold ore fighting broke out and most of the mining claims had disputes that had to be fought in court. Muchow eventually convinced these early miners to sell to his company their claims and established a profitable mine. The mine continued to operate up 1959 producing millions of dollars-worth of gold. Today the mine is still run by the Chain O’ Mines Company established by Dr. Muchow in 1920. The company conducts a number of tours to the mine to educate the public about the mining activities. The company has also conducted a number of feasibility studies on the mine with the view of reopening the mine for commercial mining. The Argo gold mills are located in Idaho Spring but it is just 4.5 miles from the Central City making it a great place to visit for the adventurous gold panning enthusiasts in the city. Mining at the current location of the Argo gold mine began in 1859 immediately after George Jackson made the very first gold discovery in Colorado near the confluence of Clear Creek and Chicago Creek. At first, miners were interested in the placer gold in the creek but soon that ran dry and they had to follow the veins into the mountains surrounding the creeks. This is what gave birth to the Argo Tunnel mining. The mining at the site continued until the 1940s when it stopped. The mine was purchased in 1976 by locals to preserve the mining history of the region. Today it is an important tourist center where you can visit and learn about early mining. The center also has a museum which tells the stories of the early miners around the Central City. The Coeur d’Alene Mine is another important gold mine near Central City. The mine was first established in 1885 and continued to operate producing thousands of gold ounces until 1940 when it closed down. The mine was later purchased by the Central City opera house association and is now open as a tourist’s attraction. You can visit the site and climb down its 700 feet ladder to learn about the various minerals such as gold, copper, and lead that were mined at the site and the various methods used to mine the minerals.